Get to meet and sing with Mårten Jansson who in the last few years have gained international recognition for his choral compositions. You will together with him sing through and listen to some of his more well-known and recent Bärenreiter editions. Mårten Jansson (*1965), elected member of the Föreningen svenska tonsättare (the Society of Swedish Composers), graduated from the Kungliga Musikhögskolan (Royal College of Music), Stockholm with a MFA degree in Music Education, Dalcroze Eurhythmics and Voice. For more than ten years he was the music director and conductor of “Carmen”, one of the most prominent women’s vocal ensembles in Sweden. Working with this choir gave Jansson the impetus to write many of his early compositions for female choir. “The knowledge that what I wrote at night would be tested the next evening was a driving force that not so many other composers were lucky to have”. 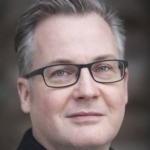 He currently teaches choral conducting and music theory as well as giving vocal tuition at the Uppsala estetiska gymnasium and Uppsala kulturskola in his home town of Uppsala.